You might be looking for the most popular tourist destinations in California if you’re planning a trip in the near future. California, the Sunshine State is home to almost everything one can imagine, ranging from breathtaking sights, uninhibited entertainment, to thriving businesses. While being the third largest state in the United States, California is the most populated and also has the largest economy. Now, this state attracts a lot of tourists around the year and that is hardly surprising, considering the beauty of its many national parks and the wonderful experiences that California has to offer. Given below are a few places that California is famous for and these will always amaze you, even after your visit. Alcatraz Island tour is a treat to history lovers. Being a popular former federal prison, as many as 1.4 million visitors opt for best Alcatraz tours to learn the nitty-gritty of the island. This national park in northern California has the most fantastic waterfalls and granite walls that had been created when carved by glaciers after the last Ice Age. The southern part of the national park boasts of huge sequoias, the largest of which are found in the Mariposa Grove. Beyond the Yosemite Falls, Half Dome and the El Capitan, lie the incredible alpine forests, through which run the Glacial Point Road and the Tioga road. Hiking across the park is a great way to discover Yosemite and the hiking trails range from easy one along beautiful lakes and streams to exhilarating hikes up mountains and rocky terrains. There are also several campsites available if you decide to stay for a few days. The theme park along with the studio is one of the most visited places in California. It has several rides and roller coasters based on the most popular movies of all time. The studio also arranges well guided tours of large movie sets and the most popular attractions are The Wizarding World of Harry Potter, Despicable Me Minion Mayhem, The Walking Dead Attraction, The Simpsons Ride and the Fast and Furious-Supercharged. There is also a Studio Tour which takes about an hour and shows tourists several locations of official movies shoots. Santa Cruz is one of the smaller cities in California but it has lovely beaches and attracts surfers from all over the world to its amazing surging swells and is a city with some of the best cold water surfing hotspots. 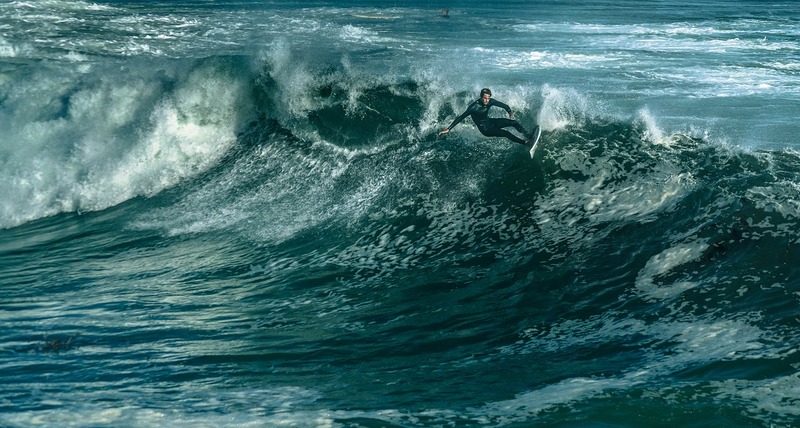 These surfing hotspots in Santa Cruz cater to the needs of all kinds of surfers; from newcomers and beginners to professionals who love the thrill of a dangerous, crashing swell. Cowell’s and Capitola Jetty are two spots which are great for those who are just starting out while Streamer Lane, in West Cliff, Santa Cruz has one of the deadliest surfs in the world. You can also visit the Santa Cruz Surfing Museum which has been created inside a lighthouse, showcases the most beautiful redwood surfboards and some early wetsuits designed by Jack O’Neil. Lying on the north of the Mojave Desert, Death Valley borders the Great Basin Desert and is possibly one of the most dangerous and unforgivable terrains in California. It also boasts of strange and terrible beauty and is filled with sand dunes, salt fields, and quite a few oases. This is also a land of many extremes; on one hand, it has mountain peaks covered in frost while on the other hand there are acres of barren, dry land. Despite such a landscape, there is an astonishing amount of diversity in Death Valley and sudden rains lead to beautiful wildflowers and the spring-fed oases are often filled with small fishes. In the south of Monterey, lies one of the most stunning places in California. With the Santa Lucia Mountains towering on one side, a drive along the State Route 1 will leave you mesmerized as you take in the rugged, yet scenic central coast the runs between Carmel and San Simeon. In Big Sur, you can spend hours on the Pfeiffer Beach that is famous for its purple sand and sun portal or go for a hike and see the McWay Falls at the Julia Pfeiffer Burns State Park. There are also some sound architectural creations in Big Sur and these include the Bixby Creek Bridge between spectacular cliffs and the old Point Sur Lighthouse, atop volcanic rocks that are still responsible for showing the way to ships sailing along the Pacific coast. For many years, this has been one of the most popular destinations in California, especially for families. Disneyland, in Anaheim, has a huge range of fun rides, arcade games and parades and stage shows that represent different cultures and recreate whole new worlds. The entertainment offered by this amusement park are for children as well as adults and apart from the theme shows and rides and games, Disneyland also has several hotels and restaurants inside the park and the Downtown Disney District provides a great shopping experience. Don’t plan a trip before knowing the most popular tourist destinations in California. It’s a big place, and you can easily spend a lot of time traveling in it. If you want to catch the highlights, this is a good place to start.